Not too much exciting can be said about the first round of mining in 2001. The time was used to prepare the pit for mining forward through the road at the eastern end and for another pass from the entrance to take a bite out of the floor. Beyond this preparation, three weeks of work produced little save beryl in matrix and more quartz crystals of all sizes and shapes. We did find three small pockets with beryl. The beryl was reassuring. We saw precious little after the August 2000 etched pockets. Finding it again was a relief. As John Mitchell said ‘When the going gets tough, the tough get going’ as he exited the Nixon Administration. After the Maine Mineral Symposium in May, I found myself alone in search of the elusive pocket beryl. Doug was convinced that the Orchard was mined out. We will see. After 3 hours of solo work, Richard Edwards joined me in the hunt. Although perhaps he does not have the x-ray eye of Doug, Richard is better at operating and maintaining the equipment and tools. Work proceeded in the final week of this round in May at the same torrid pace as before. We found (3) small vugs with pocket beryl. I impulsively gifted away these meager finds. Beyond the beryls, we found countless quartz crystals. I had vowed to myself last winter I would be more considerate of these crystals but they indeed tried my patience. We emptied scores of pockets surrounded by beryl in matrix only to find each one jammed with more and more quartz crystals. Each must be carefully emptied so as not to miss any other minerals. As we approached eastern end of the pit (road end) ,we began to find numerous pockets filled with what I call ‘micaceous mud’. Frequently we find this material in beryl casts that are well encapsulated in the host rock but are completely or partially etched out. In the photo, a small beryl from the Aug’00 pocket zone can be seen sitting above a mass of this greenish material. As beryl is chemically altered to other silicate minerals mica can be one of the byproducts. Phenakite and topaz are other possible minerals. We have found only phenakite, however. We need to examine this material under magnification. The headwall of the Orchard affords an interesting glimpse of a beryl bearing zone. Beryl is evident at road level and at least to a depth of 35 feet. It will be interesting to see how deep this zone extends. We will be able to mine it to a depth of 50 or more feet. This knowledge will give us a clue as to the depth of the beryl zone left behind in the floor. This new beryl zone is very much like the original zone at the entrance of the pit. Microcline cryst als with the spaces between filled with gemmy quartz and green and blue beryl. Interestingly the gem beryl pockets we have found at the Orchard have been in fine grained feldspar masses with little or no surrounding quartz as can be seen in this photo of the July '99 Golden beryl pocket. The pocket is the cavity visible at the bottom center of the photo. The pocket did sit above a much more attractive microcline quartz zone, however. The same sequence was repeated with the 2000 gem beryl pockets. The gem bearing pockets sat in fine grained spar above a beryl in matrix zone. Visible in the photo at the top, a schist cap covers the peg with an extrusion of pegmatite emerging on the left hand side. Schorl crystals can be seen as the block dots just under the cap. About 20’ below this feature the, pegmatite is dominated by a salmon microcline area with abundant pockets. So far these pockets have produced only quartz crystals. Lower down the headwall we found the beryl pockets mentioned above. One pocket contained an etched blue beryl 10 mm in diameter and 25 mm long. We found some more etched fragments in this pocket. Below this we encountered 2 golf ball sized vugs each filled with green mica material and an unetched yellow pocket beryl. These smaller vugs were in a more fine grained spar similar to large gem beryl pockets we have opened. Our work at this end of the pit required us to let the blasted material build up in order to reach the top bench with the bucket of the excavator. This enabled us to completely clean off the pile on the top and start benching down.. Unfortunately this buried in the floor. The floor had filled my thoughts all of the past winter. Just as we wrapped up in November, we had finally gotten below the schist zenolith standing vertically in the pegmatite and perhaps the cause of the barren zone. Under it, small green yellow gemmy beryls were mixed in a white albite feldspar matrix with black tourmaline. Our last few holes drilled in November entered some pockets that gushed considerable amount of water. We were unable to open these pockets then. Most of our work so far in 2001 has been 20-30 feet above this area and 15-20 feet beyond it towards the road. In benching down we have exposed a very large quartz pod whose outer margin is crystallized. The eastern end of this mass is nearly black in color and ends in pockets in salmon spar filled with the green mica material. We have another 2-3 days of mucking out to properly expose this area and get back to our spot in November. We will then be able to mine across the floor at this depth up to the headwall. From there our choices are to remove the substantial overburden above the pegmatite and proceed under the road or go back to the entrance and start again along the floor. The next session of mining will give us more direction. 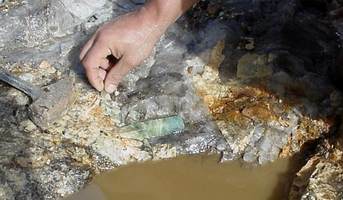 Writers note: For those of you who wonder why there has been no postings in 2001, let me say that it is indeed easier to write about spectacular gem finds and not so exciting to write (and read for that matter) about the minutiae of mining. I write this as we race down a back country road in Poland towards Gdansk. I squeeze in this reporting where ever I can.